Every week there's at least one new release you'd have to pay me handsomely to sit through. Those include: Adam Sandler flicks, Nicholas Sparks adaptations and Transformers that arise from the ocean. Getting bludgeoned by CGI'd alien sea snakes is akin to torture and I suspect audiences will largely reject 'Battleship' over similar sediments plus the fact 'The Avengers' provided enough mind-numbing action for a lifetime. The Avengers ($50M) - Over $1B (yes, that's a B) worldwide, $400M of that stateside. If the superhero sextet rakes my estimate, they will shoot to number six on the all time domestic box office list. 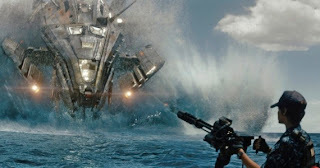 Battleship ($32M) - Having the unfortunate timing of setting sail two weekends after the aforementioned 'Avengers', the Peter Berg big screen adaptation of the Hasbro board game is set to become the biggest bomb since 'John Carter'. The Dictator ($27M) - Much funnier than it has a right to be, Sacha Baron Cohen's first non-gotcha flick will exceed expectations due to the recent void of laughs at the multiplex. Here's my B- review. What to Expect When You're Expecting ($18M) - Think 'Valentine's Day' meets 'He's Just Not That Into You' - a slew of superstars simply collecting paychecks and bringing banality to theaters. Dark Shadows ($13M) - As expected, the wacky world of Tim Burton v18.0 tanked - should be the final nail in the coffin for Johnny Depp's endless stream of eccentric roles.